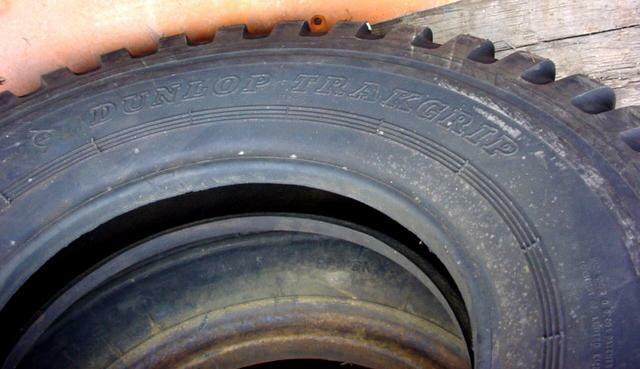 This page will focus mainly on the 9.00-16 tyres Dunlop T24 Trak Grip tyres as used on the 15-cwt series of CMP trucks. "pneumatic" or general purpose type: with more rounded shoulders. All had a 5º bead angle. This is a post-war tyre, manufactured for the Daimler Ferret Scout Car, but it is very similar to the wartime tyres as fitted on CMP trucks. Photo courtesy of Richard Notton. 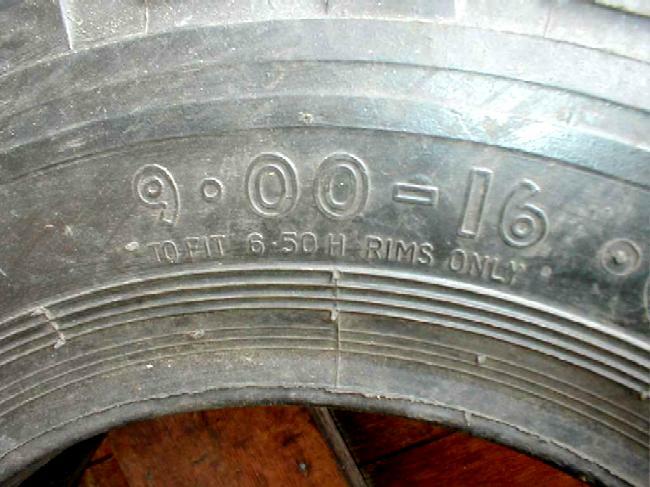 The side is clearly marked 9.00-16 and the tyre is meant "TO FIT 6.50 H RIMS ONLY". 6.50 stands for the width of the rim in inches - note the 16" CMP rim is 6" wide! The meaning of "H" is unknown. 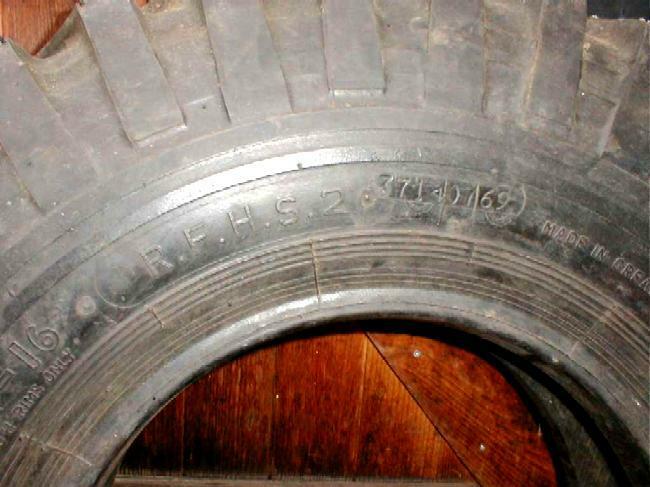 "R.F.H.S.2" denotes this is a tyre for the Ferret Scout Car. 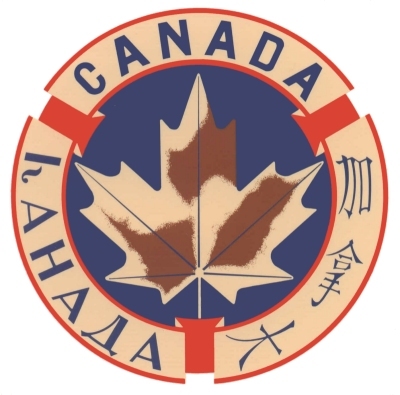 Could it stand for "Run Flat High Speed"? The marking melted in the side is likely to be the manufacturing date, July 1969. The side wall is 4" thick, this is what prevents to tyre to collapse when the air pressure is diminished. 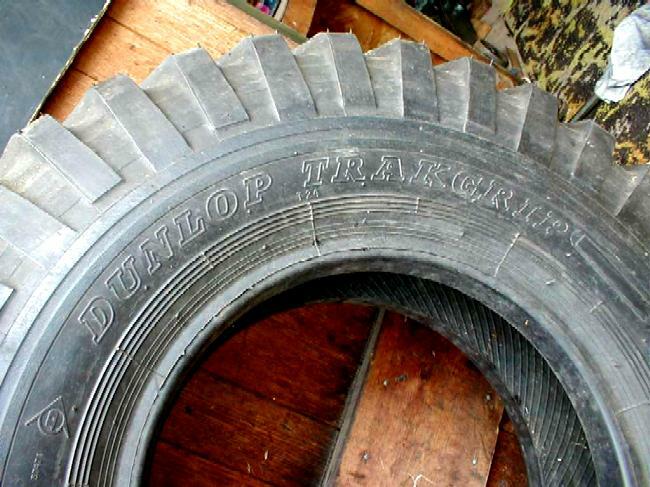 Here is another Dunlop Trak Grip tyre, a pneumatic (as in non-run flat) type. Note the tread bars do not run along the side as far as on the run flat type shown above. This type of tyre was fitted postwar to many British army vehicles like the Bedford MW and early Land Rover 1 tonne trucks. Photo courtesy of Dennis Schneider. 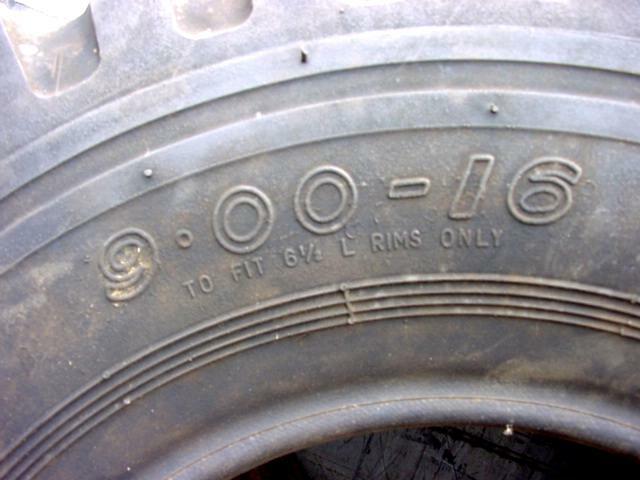 Again, the side is clearly marked 9.00-16 and the tyre is meant "TO FIT 6.50 L RIMS ONLY". Other markings include "6 PLY RATING" and "MADE IN GREAT BRITAIN". Richard Farrant notes "6.50 L rims are wellbase, i.e. one-piece, and are as fitted to the Land Rover 1 Tonne (101), the tyres for these were 6 ply". 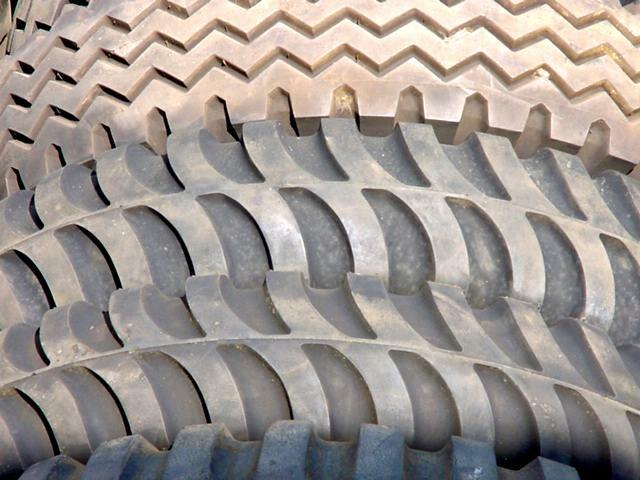 This picture clearly shows the typical Dunlop Trak Grip tread pattern. Note: Narrow directional bar V tread chevron, manufactured until early 1970's. Note: Unusual curved wide bar V chevron, post WW2 manufacture. Note: wide bar directional V chevron. 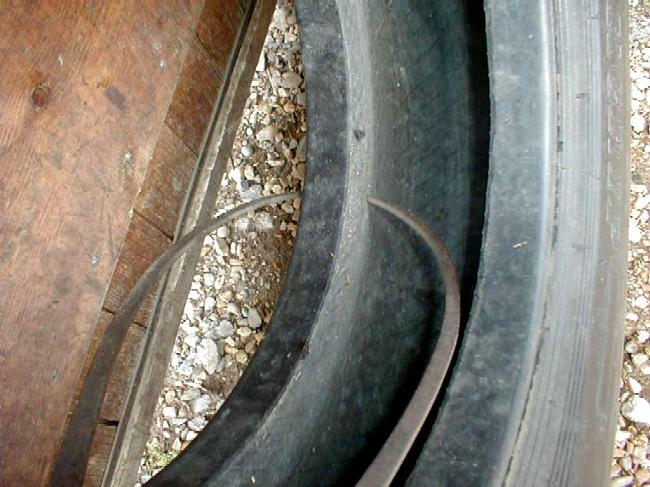 Note: curved directional wide V bar tread, found on a Fordson WOT2D. Note: original WW2 vintage tyres made in UK; two of them are marked RF; tread pattern is different to the T24 Dunlops. Many Trak Grip tyres are marked "For British rims" or "For American rims". The main difference is that one has a 0º bead angle, while the other has a 5º bead angle. Various restorers have reported contradicting experiences fitting tyres to 16" CMP split rims. Some tyres fit without trouble, others only fit with lots of trouble or after grinding the rim or shaving the tyre bead. As "the jury is still out on this problem", make sure you read up on the subject before embarking on fitting tyres! search results for "Dunlop T24"
With special thanks to Richard Notton, Richard Farrant and Mike Kelly for their assistance in compiling this page.